Christian’s Library Press has released Rooted & Grounded by Abraham Kuyper. This short volume includes first-ever translated sermons by Kuyper showing his passion to the church. While he’s well known for his writings on theology and common grace, this book demonstrates Kuyper’s enthusiasm for the church as well. In his seminal sermon, included in this volume, Kuyper outlines the basic distinction and connection between his conception of the church as institution and the church as organism, a view which became formative for neo-Calvinist reflection on the church and society. Abraham Kuyper’s Rooted & Grounded is the Word of the Lord for the Christian church today. Christians know the Gospel must permeate every area of life organically, that every vocation is integral and not accidental to the missio Dei, as my friend and colleague Steven Garber is fond of saying. This is what Kuyper means when he talks about the church being rooted in the organism of the Gospel. 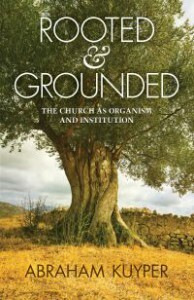 But Kuyper goes much further, reminding us that the church is “First rooted, then grounded” in an institutional form with core doctrinal, liturgical, and office-bearing responsibilities that norm its vital organic life.Just as faith and life cannot be separated, so also the church as an organism and an organization cannot be separated. Too often, however, I hear from frustrated leaders in the faith and work movement the faulty advice to bypass pastors, church governing boards, and seminary classrooms and move directly to workplace ministry without hindrance or obstruction. Abraham Kuyper’s robust ecclesiology discourages renewal movements from doing end runs around the church and seminary. This book is available online from Christian’s Library Press here. Additionally, the Kindle edition is available here.